Islington is buzzing with boutiques, bars, clubs and restaurants as you can read about in Time Out . The area has so much to offer and can be an attractive place for young professionals to put down roots. It is an increasingly popular location for first time buyers. However there is another side to Islington with significantly high crime rates. The Chart below from UK Crime Stats shows burglary rates in Islington North between May 2017 to April 2018. Islington burglary rates appear to be higher in comparison to areas we have written about previously. This is our overview of security in Finchley. Islington North has an approximate population of 106,883 and had 1187 burglaries within a year, 1 burglary for every 90 people. Finchley and Golders Green has a population of 124,633 and had 1165 burglaries within a year, 1 burglary for every 106 people. Hampstead has a population of 11,256 and had 92 burglaries within a year, 1 burglary for every 122 people. This Chart shows burglary rates in Islington South and Finsbury between May 2017 to April 2018 where burglary rates appear to be very similar to North Islington. Islington South and Finsbury have an approximate population of 108,784 and had 1199 burglaries within a year, 1 burglary for every 90 people as is the case in Islington North. This graph shows how Islington crime rates compare with other London areas. You can search by the type of crime. Islington appears to have the 7th highest burglary rate out of 32 areas shown. It is also 3rd for crime in general! 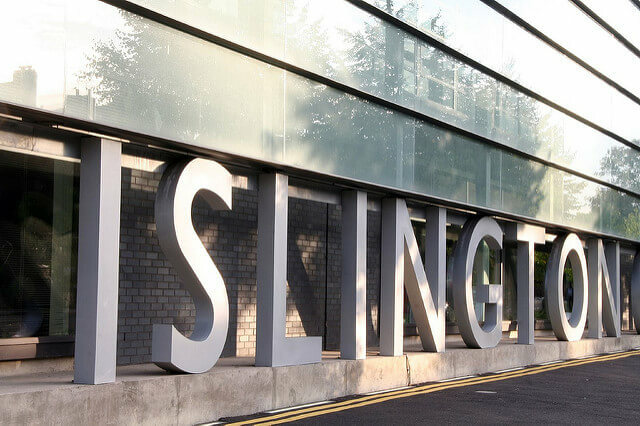 This is quite significant and has a great impact on people living in the Islington area. Speaking from experience as a London Locksmith dealing with emergency burglary repairs, I notice that there tends to be a different approach to burglary in Islington. I mentioned in my post about The Best Places to Live in North London from a Security Perspective that forced entry is much more common in Islington than in other areas of London. The levels of theft and robbery in general are much higher in Islington than other areas. Drugs and violent crime seem to be more of an issue. There is a definite difference in the ways intruders operate and therefore there is a definite difference in the home security measures required to effectively protect a property in areas like Islington. Security grilles for doors and windows can be fixed or collapsible, in different colours and finishes and different designs. When chosen well they can really compliment the look of a property. They can be made discreet or they can stand out as a feature. It all depends on what the customer wants. There are many different options. One thing that all security grilles have in common is the high level of security that they provide. They act as a great deterrent and are a real challenge for an intruder to gain access to. Most burglars are unlikely to even try to access a property with security grilles. 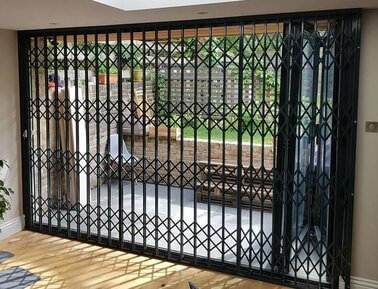 We fit a lot of security grilles in Islington and also in other areas such as Hampstead and Highgate. Click here to see our Security Grilles Gallery. There are some examples where the fixed grilles are hardly noticeable as they are lined up with the beading on the windows. 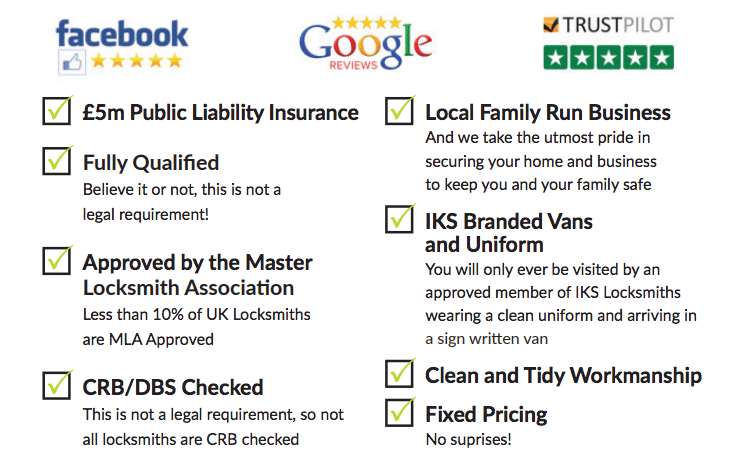 IKS Locksmiths are trusted local locksmiths in North London. We are MLA approved property security specialists. If you are choosing a locksmith in Islington make sure they tick all the boxes. It is so important to check that a locksmith is CRB/DBS checked and qualified as there are locksmiths operating with no credentials or ethics! If you would like to find out more about burglary rates in other areas you can search by your postcode here. For our Barnet crime overview click here. If you need a quick 24 hour Islington locksmith give us a call. We operate a 24hr emergency service and provide a free no obligation quote.